Armoured combat is a uniquely SCAdian sport. It differs from the combat forms of other living history organisations because the weapons are made of rattan, a type of bamboo. This allows the combatants to strike with full strength, not being limited by fear of injury from landing a blow on their opponent. The result is a virtuosic display of combat that a real tourney-going knight of the middle ages would find quite familiar. Armoured combatants, also called heavy fighters or just fighters, train in and out of armour, and must satisfy their marshals that they are safe, responsible and competent before they can be authorised to fight in tournaments and wars. The most important tournaments in the SCA are the Crown Tourneys, held twice a year in branches all over the Kingdom to find the next King and Queen. The Barony holds weekly training in armoured combat at Kraken Hall on Wednesdays from 7.30-9.30pm. Contact the Knight Marshal for information. 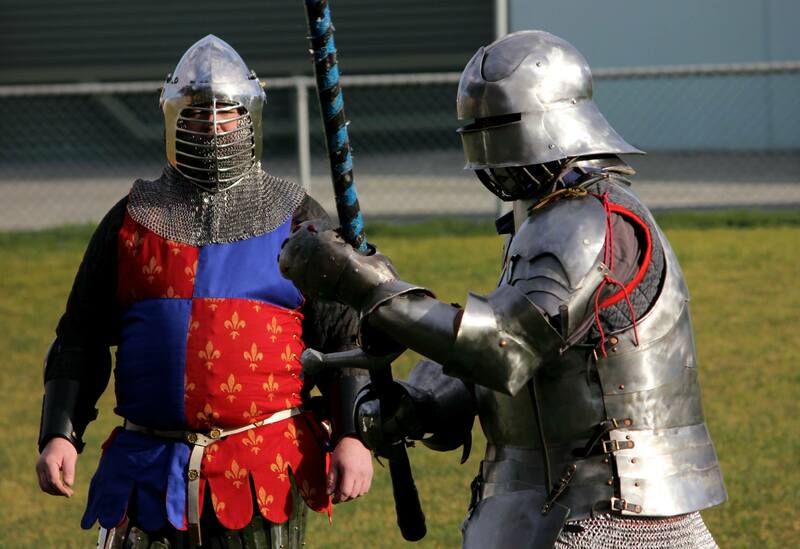 Medieval combat with swords, shields and armour is great fun, but like any sport, there are rules and regulations to ensure the safety of the players and spectators. The Rules of the Lists set out the Society’s standards on weapons and armour, and how hard the fighters are allowed to hit each other. The SCA has a good safety record and we consider our sport safer than playing rugby; however, as with any sport, there is an inherent risk involved. We try to make participants aware of the dangers, and insist on responsible behaviour.